Malaysia, located in South East Asia is known as an affordable destination like several other Far East destinations like Singapore, Thailand, etc. However, the natural beauty and global appeal of this country are undeniable. If you want an affordable yet exciting holiday package; a travel to Malaysia is the destination for you. On the other hand, Malaysia travel packages have a tropical rainforest, the elephant in national parks and a mosaic of serene lush landscapes. The harmony of Buddhist temples to enthralling scuba diving spots with rich and exquisite marine life is fascinating. Whether you go white river rafting in Pahang or enjoy a comfortable boat ride through the prehistoric rainforest in a mountainous region, you would be completely gratified by this unique experience. You will enjoy a trek through Cameron Highlands, have a blast on a wildlife safari in Kinabatangan Wildlife Sanctuary, explore Mulu cave ride or check out the birds in Kuala Gula Bird Sanctuary. There is kaleidoscope of natural scenic destinations and unique regional experiences waiting to be explored in the region. Your holiday packages will be incomplete if you miss the heart of Malaysia travel breathing through its forests and villages. The tropical charm of this country is memorable and fascinating enough for you to even forget the new Malaysia that flourishes through the cities. Kuala Lumpur is the global city. If you overlook the South East Asian culture seeking the way out through language, people, and historical sightseeing destinations, you would believe that you are in some city in a developed country. You will witness latest technological innovations, skyscrapers like world’s tallest twin towers, shopping malls, hottest international cuisine and cocktails scene, chick nightclubs and a plethora of cultural experiences such as art galleries, international festivals, and theme parks. 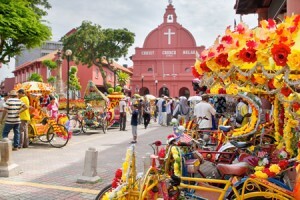 Malaysia travel packages are filled with these urban, modern and savvy experiences for you to indulge. After all the greenery and tranquility, you would want to have some real fun in the country. The Sunway Lagoon is one of the most popular amusement parks in Asia, and there are plenty of breathtaking rides awaiting you in this place. You will be able to hop into different types of rides in water and land when you visit the park. If you are traveling with your family, this would be the place that your kids will love the most. You can decide to not admire museums, art galleries and local sights like Waterfront promenade, Chinese temple, Thean Hou Temple, Kellie’s Castle, Sri Mahamariamman Temple and botanical garndens. You will land up loving Petaling Street Market, Main Bazzar, Mid Valley Mega Mall, Pudu market, Ruai bar, Zouk lounge, Luna Bar, KL Festival, Le Tour de Langkawi, KL International Tower Jump and Borneo Cultural Festival. Even an ultra-modern tourist would enjoy himself at the local shopping centers, lounges, and festivals. The modern theme has been raving across Malay cities for a reason. They are popular among tourists and natives alike. Kuala Lumpur holiday packages are created to ensure that you get comfortable in the nightclubs, shopping centers, and boat cruises. So, regardless of what you love and what you hate, you will find something admirable, fascinating and memorable enough in Malaysia to revisit this country again. With all these beautiful tourist spots and plenty culinary adventures in Malaysia options, Malaysia would be an ideal vacation spot for all sorts of people.